Wedding tiaras are elegant jeweled headpieces that a bride wears. Jeweled tiaras are designed just like a crown. However, nowadays, brides are trying out different and unique styles and bringing variation to their overall attire. While many brides wear jeweled tiaras, others like to wear a crown made of flowers. Whichever style you choose, the tiara should be bought by keeping the bride’s wedding hairstyle in mind. These tiaras can be golden or silver in color according to your bridal look and may contain crystal, transparent, or even colored rhinestones. They are available in many styles, but the two most popular ones are a large-sized tiara that sits high on your head and a small-sized one that can be wrapped around a bun or other similar hairstyles. Among all the wedding accessories of the bride, one of the more complicated to pick is a tiara. Most brides love the traditional princess look that a crown gives as it makes them feel like royalty. However, not every bride gets a chance to buy a particular tiara that they love due to its high cost. 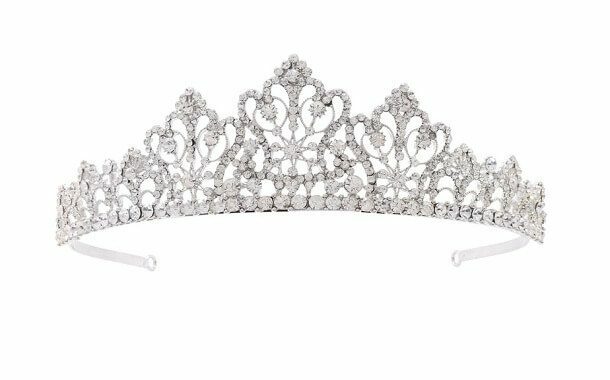 Nevertheless, if they search thoroughly on the internet or in small jewelry shops, chances are that they can find a low-priced version of the tiara they want. While these low-cost tiaras might not be original or of exceptional quality, due to their exquisite looks, this inexpensive piece of jewelry can make you feel like a princess on your wedding. Moreover, brides-to-be should start looking for their bridal accessories, especially tiaras, a few months before the wedding, as sellers provide discounts on special occasions or a particular season. Below are some more details about the price of a wedding tiara. If you want to get a wedding tiara with precious gemstone details, you can find one in the range of $75 to $200. These tiaras are mostly made of metals and possess an expensive look and feel. Depending on the designer and the effort and materials put into the making of a tiara, it can even cost about $250 to $500 or more. This category contains tiaras designed with gemstones or crystals. If you’re looking for an economical tiara, they fall in the price range of $50 and less. These tiaras are often plastic, coated with metal, and possess simple rhinestone details. Surely, they will not have any precious crystals or gemstones, but they may have inexpensive lookalike artificial gems to make them look just like the expensive ones. The price of a good-quality, cheap tiara start from $25, while the price of a simple rhinestone headband ranges from $13 to $16. You can find an eye-catching tiara at a very low price if you’re shopping in a sale season such as Black Friday. You can easily acquire huge discounts and save lots of money. You can also look for an inexpensive tiara on online shopping sites such as eBay. Also, different bridals shops offer the same tiara at different prices, so do your research before buying your perfect headpiece. By comparing prices, you can easily get your hands on the cheapest possible option. If you’re not much into the shiny and glittery statement, then you can pick a floral headband as it gives an elegant look and is cost-effective too. Just take your headband or tiara with you when visiting your hairstylist so that they can pin up your hair according to it. The tiara that you are wearing should complement your veil, hairstyle, and makeup. According to the Bridal Association of America, the average bridal veil can cost about $274. However, the price of a cheaper veil starts at $20. If you’re looking for a more inexpensive version, then look for sales or discounts that stores offer. Also, your wedding updo and makeup costs play a significant role in your wedding. If you’re paying a stylist, then the average cost of a bride’s makeup and hairstyle is around $183. However, some beauty schools and salons allow brides to get their hair done in $30 to $50. If you, your sister, or a close friend knows hairstyling and makeup, then it’s a plus point as you can easily save your money.